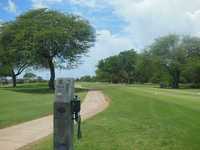 The 18-hole NAS Barbers Point Golf Course in Barbers Point NAS, HI is a military golf course that opened in 1963. NAS Barbers Point Golf Course measures 6385 yards from the longest tees and has a slope rating of 119 and a 70.1 USGA rating. Nice golf course to play on and away from the city. Great course. Easy to walk. Stay on the fairways. Got lost once going from one green to next tee box! Could have better directions but overall a great course for golfers who don't want to be beat up by a course.